Meet Surf City photographer, Sally Vennel, a summer visitor since 1936 and now full-time resident. At age eleven she received her first camera, an Argus C3, since that moment Sally has been smitten with photography. Inspired and encouraged by her father, Ralph “Doc” Secor, they shared a passion for photography and a deep love of Long Beach Island. Born in 1898, Doc began taking photos in his youth with a Kodak reflex camera at Ridgeway High School in north west Pennsylvania. Always an athlete and star basketball player, he contracted typhoid fever while digging ditches to get in shape for football his senior year. Long before the advent of antibiotics, the infection to his leg was so severe a local doctor believed amputation was necessary. Another doctor stepped forward to use his skills as an osteopathic physician to heal Doc and save his leg. After graduation from Allegheny College, Doc and his new wife, Betty, bought a Model T Ford right off the assembly line in Pittsburgh for $250. They headed west to Rocky Ford, Colorado where Ralph had accepted a teaching position. Within the first 200 miles of their journey the young couple would stop to fix 11 flat tires. Before the introduction of reinforced steel radial tires in 1946, rubber balloon tires would puncture on uneven rocky roads. With his trusty Kodak, whose slogan “Press the button, we do the rest,” Doc chronicled their adventure of camping across the country. Always grateful that osteopathic medicine saved his leg, Doc chose to enter Philadelphia College of Osteopathy. Relying on his athletic ability and photographic talents, he earned tuition by coaching their athletic teams and serving as the school photographer. After graduating in 1929, he opened his medical practice in Philadelphia, Pennsylvania at Caryle and Aleghany Avenues. It wasn’t long before he, like most of you reading this story, discovered the ocean delights of Long Beach Island. Doc and Betty continued to be avid weekend campers. Having found the perfect location with ample fresh water, they erected their canvas safari tent behind the Coast Guard Station in Loveladies with other likeminded folks. Today a summer rental without air conditioning or a dishwasher is considered roughing it. For Doc and Betty keeping an Everdur gas stove lit with a hand pump on a damp, misty morning or finding shelter in the wide high dunes for a make shift bathroom was part of the adventure. 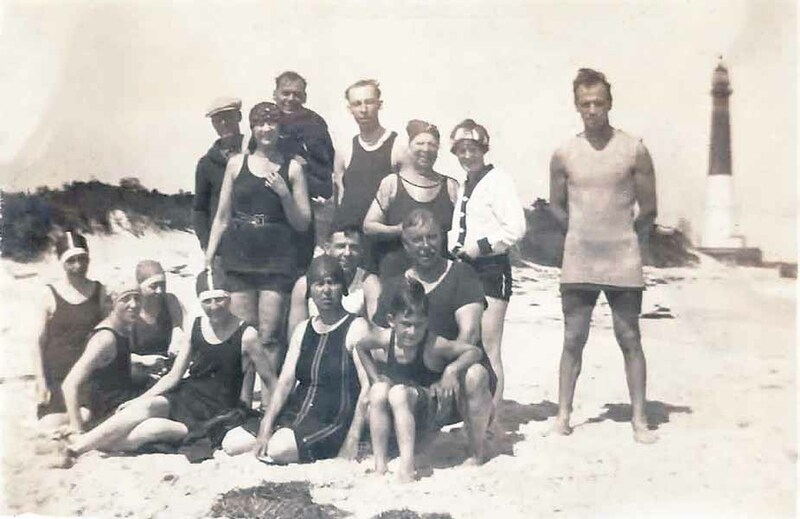 Undeterred by primitive conditions; their days were spent fishing and swimming in the LBI surf. Evenings were enjoyed under the stars around an open fire – roasting the catch of the day for dinner. At night, they fell asleep on canvas cots listening to the gently rolling waves protected from pesky mosquitoes under bobbinet. 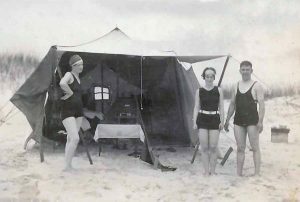 In 1938, Ralph and Betty built a large cape cod on 22nd Street in Surf City where Sally and her husband now live full-time. Sally spent summers teaching swimming and, along with her sister Georgia, racing at the newly founded Surf City Yacht Club. Her passion for photography grew with her. By age 14, she sold photographic slides of the club to a post card company in Point Pleasant. Following her Dad’s path, Sally attended Allegheny College – taking yearbook photos, working for the schools advertising department, and developing the new color film.